On assignment for Fortune magazine in the summer of 1936, Walker Evans accompanied the writer James Agee to Hale County, Alabama, to investigate the effects of the Depression on the lives of tenant farmers. The blunt honesty with which Agee and Evans conveyed a bleak national situation resulted in Fortune's rejection of the story as too controversial, but Agee's account and thirty one of Evans's images were published in 1941 as Let Us Now Praise Famous Men. 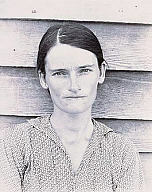 This photograph of Allie Mae Burroughs, the female head of one of three sharecropper families on whom Evans and Agee focused, has become an icon of twentieth century art. The simplicity of Mrs. Burroughs's self presentation, the shallow depth of field, and the narrow tonal range of the print seem to illustrate perfectly the austerity of her circumstances. But it is Evans's masterful rendering of her individual demeanor-the strength of will communicated through the intensity of her expression-that transforms the image from a sentimental portrait of socioeconomic vulnerability into a striking declaration of human determination. Shimon, John, and Julie Lindemann. Unmasked & Anonymous: Shimon & Lindemann Consider Portraiture. Milwaukee, WI: Milwaukee Art Museum, 2008, p. 45, cat. 9, b/w illus. Milwaukee Art Museum News, July 2006, no page number, color illus.